Ken Yeang, the world-famous Malaysian architect complains that ‘Pursuing a kind of national architecture is a dilemma imposed by foreign architects’. He says that the Americans and Europeans can’t do it ‘Therefore, why should we define a national architecture, but these developed countries cannot?’. He is wrong. The architectural style known as International Modernism is really a North European style which just happens to be widely used in a context-insensitive manner. For garden design and landscape architecture there is a far stronger case for a context-sensitive approach. Countries, regions and small localities have different geology, different climates, different hydrology, different flora, different fauna, different histories and, above all, different ways of using outdoor space. So why on earth should there be an International Style of Garden Design? The only possible excuses are the general lack of professional education in garden design and, in the case of landscape architecture, the general ignorance and lack of interest in design theory. 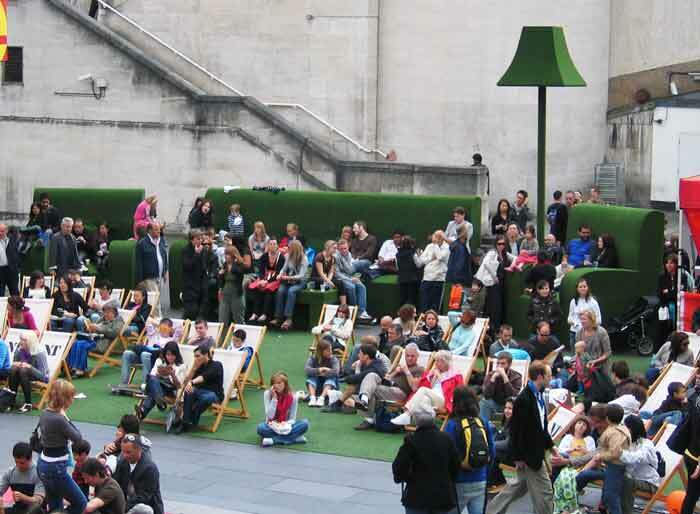 Curiously, the nearest thing to an agreed principle of landscape architecture is that ‘designers should consult the genius of the place’ (the genius loci). It is a great principle. But it has to be carefully considered and ‘though the genius must always be consulted she does not always have to be obeyed’. What most designers do is take a quick glance at the local character, find out a little about soils, find out some more about climate – and then do what they planned to do in the first place. The people should shout them down. This entry was posted in Garden Design, Landscape Architecture and tagged context-sensitive design, design theory, genius loci, genius of the place, international modernism, ken yeang, Landscape Architecture, malaysian architect on 29th July 2008 by Tom Turner. 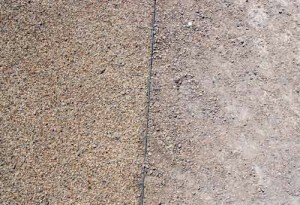 The University of Greenwich has re-done much of its paving with resin-bound gravel on its Maritime Campus. It has one the most scenic campuses in Britain and certainly needs to be ‘paved with care’. But was resin-bound gravel the best choice? Some of the pedestrian paving, usually adjoining buildings, is done with a beautiful riven sandstone. It comes from Yorkshire and has the local name Yorkstone. This is an excellent material. Other pedestrian paving, often running through grass areas, is ungraded gravel. This too is a good choice, though it is hard to fathom why they used granite instead of the local flint. 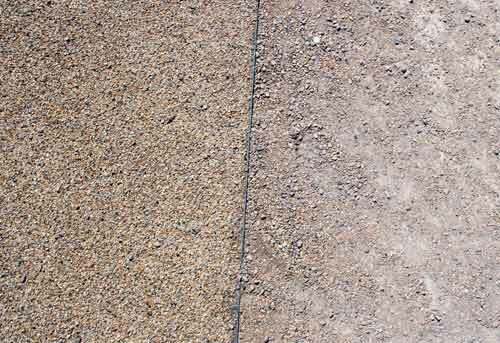 Most of the new paving on the campus is resin bound and uses a small-diameter flint gravel aggregate (2-4mm). For the central roadway this was a good choice. A bitumen macadam basecourse supports the weight of vehicular traffic. But the road is used as much by pedestrians as by vehicles and it was well worth the extra expenditure on resin bound gravel to hide the bitumen. But I can’t see the point of having used resin-bound gravel for purely pedestrian walks or for the new car parks: (1) it costs a lot more money (2) it is impermeable and therefore works against Sustainable Urban Drainage System (SUDS) objectives (3) it does not have that nice crunchy sound you get from gravel (4) it looks phoney – like a plastic imitation of gravel (5) it is out of keeping with the historic character of the Maritime Campus – where unbound flint gravel is the traditional material. This entry was posted in Historic garden restoration, Landscape Architecture and tagged car parks, drainage system, gravel, paving, resin bound gravel, sustainable urban drainage, university of greenwich on 22nd July 2008 by Tom Turner. 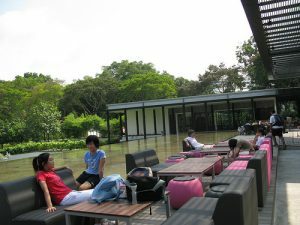 What is the difference between garden design and landscape architecture? Personally, I see garden design as much closer to a fine art than landscape architecture. Art is for art’s same and gardens are for garden’s sake. Landscape architecture is often for a public or private body with a shedful of axes to grind. It is similar to the distinction between painting and graphic design or between sculpture and product design. This entry was posted in Garden Design, Landscape Architecture and tagged american society of landscape architects, garden designers, Landscape Architecture, landscape design, open space, professional award, residential design, urban landscapes on 17th July 2008 by Tom Turner. 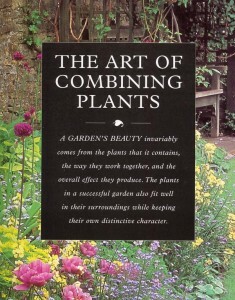 Having long believed that good plant combinations are a key to successful planting design, I was pleased to get a copy of The Encyclopedia of planting combinations by Tony Lord and Andrew Lawson (Mitchell Beazley, 2005). They are both expert photographers and Tony Lord, who wrote the text, is a former Gardens Advisor to the UK National Trust. Unsurprisingly, the photographs are excellent – if not quite as excellent as one might have expected. Disappointingly, most of the text is about the individual plants. Since there are many books on individual plants, this could have been omitted. The plant descriptions are followed by remarks on plant combinations and, as one might expect from a pair of photographers, they have a good eye for line, colour and texture. 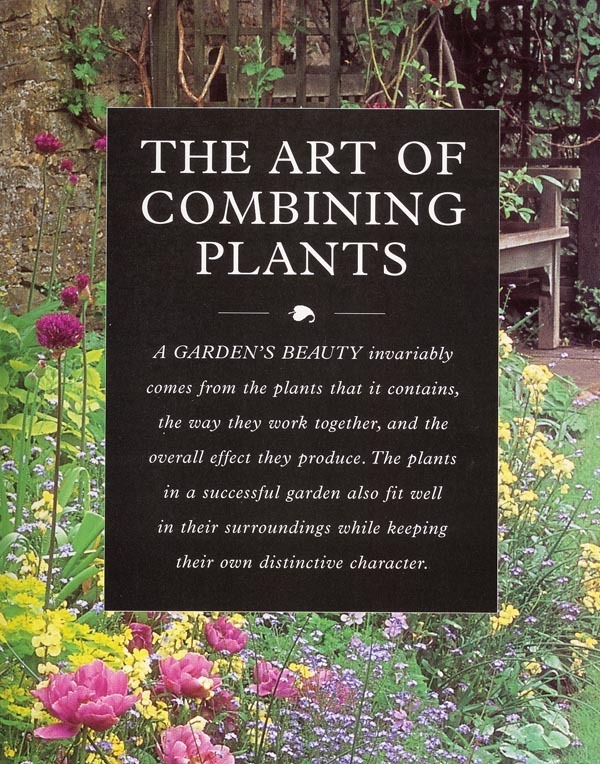 The most surprising thing about the book is the appalling standard of the introductory section on ‘The art of combining plants’. It reveals the author to have no understanding of garden design as a fine art and somewhat reminded me of books written in the 1920s. 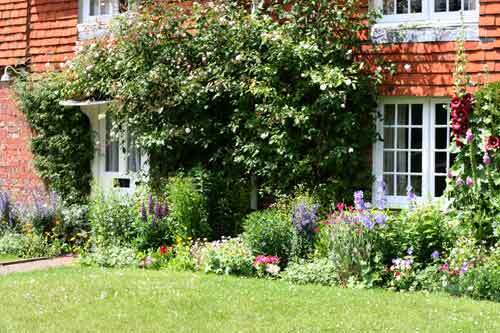 Take the opening statement as an example: ‘A garden’s beauty invariably comes from the plants that it contains, the way they work together, and the overall effect they produce’. Does this apply to the Alhambra, to Versailles, to the Taj Mahal or to Rousham? Of course not. A garden is a composition of five elements: landform, vegetation, structures, water and paving. If one element is strong and the other four are weak you will not have a truly great garden. After this blinkered introduction, the first sentence is ‘Making a successful garden is a question of balancing what is already there with what is required of the plot’. But what IS ‘required of the plot’. The author does not say. 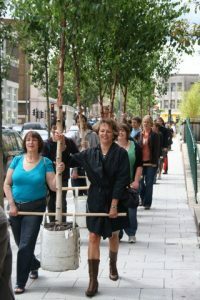 The second section (p.13) opens with the sentence ‘Once any hard landscaping is in place, selection of the plants can begin’. Goodness gracious me! You should not employ a gardener when you want your central heating fixed – and you should not employ a horticulturalist when you want a design for your garden. Similarly, the UK National Trust should employ horticulturalists for horticultural advice and garden designers as gardens advisors. 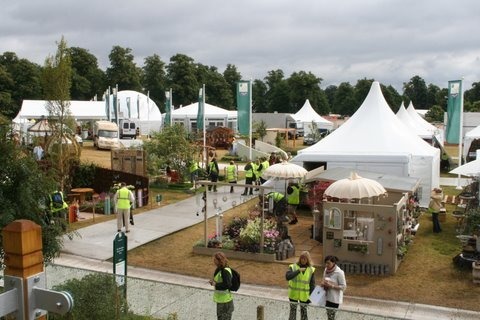 This entry was posted in Book reviews, Garden Design, Historic garden restoration, Landscape Architecture and tagged andrew lawson, Garden Design, national trust, plant combinations, planting design on 11th July 2008 by Tom Turner. 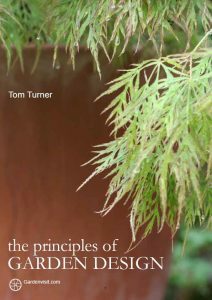 I had an idea for a book on the principles of garden design about 20 years ago. The publishers I offered it to (Mitchel Beazley, Francis Lincoln and Conran Octopus) each invited to me meet them and said it was a ‘very interesting idea’. But they did not sign me up and the idea went on the back burner. Some of the content went into the final section of City as landscape (Spon 1998) and when the idea returned to the boil in 2008 I decided to do an eBook. 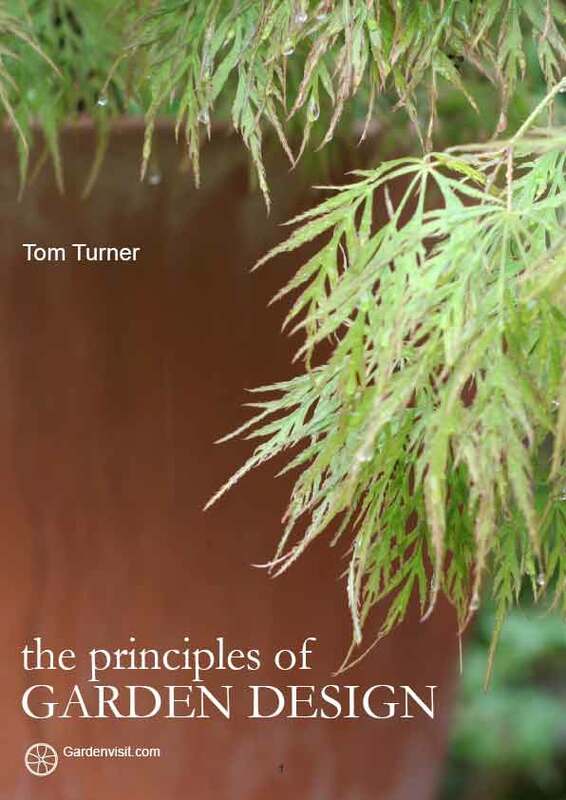 It is now available under the Gardenvisit.com imprint: The Principles of Garden Design, Tom Turner (ISBN 978-0-9542306-2-3, 45 pages, 130 illustrations, 2008). Comments would be most welcome and journalists can request review copies. These points are discussed with 130 illustrations and I am puzzled as to why they are not already embedded in the literature of garden design. Idle chat about ‘year round interest’, a ‘blaze of colour’, ‘focal points’, ‘specimen plants’, ‘water features’ etc is all very well – but it is no substitute for having a firm grasp of the principles of garden design. To draw an analogy with cooking, we can say that an over-reliance on recipes is no substitute for a grasp of the principles: use good materials, don’t overcook, take care with the sequence of dishes. This entry was posted in Garden Design, Landscape Architecture and tagged eBook, Garden Design, principles, tom turner on 3rd July 2008 by Tom Turner. 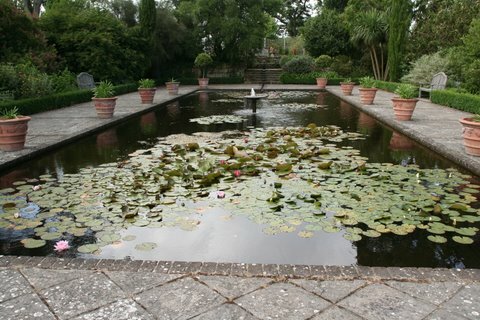 I went to visit Borde Hill Garden in Sussex last Saturday. Since my last visit, it has acquired a so-called Italian Garden. 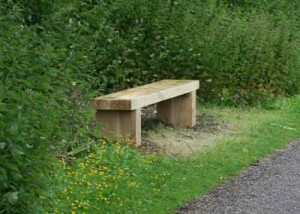 It was funded by the UK Heritage Lottery Fund. Regrettably, it is of poor quality and cannot possibly, by any indecent stretch of the imagination be regarded as part of England’s Heritage. So why did the HLF pay for it? Why should the garden be described as ‘Italian’? I have seen anything like it in Italy. Why should the Heritage Lottery Fund be paying for poor quality unhistorical garden designs? Why not adopt the historical solution and make the space into a tennis court, asking players to wear white flannels and eat cucumber sandwiches? Or why not go for a genuinely modern garden design? The What We Do page on the HLF Heritage Lottery Fund Website states that ‘The Heritage Lottery Fund is the UK’s leading funder of our diverse heritage and the only heritage organisation that operates both across England, Northern Ireland, Scotland and Wales, and funds the entire spread of heritage – including buildings, museums, natural heritage and the heritage of cultural traditions and language…We help groups and organisations of all sizes with projects that: conserve the UK’s diverse heritage for present and future generations to experience and enjoy;”. I was pleased that I could find no mention of Borde Hill in the HLF website and assume they are ashamed of having funded the work. In fact I would like to find a What We Regret Having Done page on the HLF website. They would earn Brownie Points for transparency, open government etc. We all make mistakes. This entry was posted in Garden Visiting, Historic garden restoration and tagged Borde Hill, Heritage Lottery Fund, Historic garden restoration, HLF, rill, tennis court, uk heritage on 1st July 2008 by Tom Turner.